iSkysoft DVD Copy Pro for Mac is a powerful Mac DVD copy software that can Copy D5 and D9 Movies on Mac, Specially support D9 to D5 compression burning.This Mac DVD copying software allows you to output video_ts,iso image, dvdmedia file and directly burn your DVD movies to new DVD discs. It offers Main Movie Copy and Customized Copy and supports copying with external Optical Driver, even you can backup your DVD Movies to the external hard disk. ...... can backup your DVD Movies to the external hard disk. 1. Offer Main Movie Copy and Customized Copy. 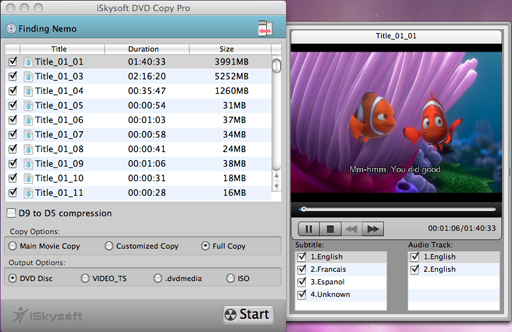 2. iSkysoft DVD Copy Pro for Mac support copying with external Optical Driver. 3. Backup to the external hard disk available. 4. Support D9 to D5 compression burning. 5. Copy DVD in fully copy to save whole movie contents. 6. Copy DVD to ISO Image on Mac. 7. Copy DVD movies from your DVD Discs to save them as video_ts File on your Mac. 8. Allow you to output dvdmedia file, which can be directly playable on Apple DVD Player. 9. Burn your DVD movies to new DVD discs. 10. Keep 100% movie quality in the copy process on Mac OS. 11. Speed up the full copy burning time twice as before. Qweas is providing links to iSkysoft DVD Copy Pro for Mac 2.2.1.23 as a courtesy, and makes no representations regarding iSkysoft DVD Copy Pro for Mac or any other applications or any information related thereto. Any questions, complaints or claims regarding this application iSkysoft DVD Copy Pro for Mac 2.2.1.23 must be directed to the appropriate software vendor. You may click the publisher link of iSkysoft DVD Copy Pro for Mac on the top of this page to get more details about the vendor.